Exploring individual and collective formation of gender identities, this book contributes to current scholarly discourses by examining plays in the genre of 'erudite comedy' (commedia erudita), which was extremely popular among sixteenth-century Italians from the elite classes. Author Yael Manes investigates five erudite comedies-Ludovico Ariosto's I suppositi (1509), NiccolÃ² Machiavelli's La Mandragola (1518) and Clizia (1525), Antonio Landi's Il commodo (1539), and Giovan Maria Cecchi's La stiava (1546)-to consider how erudite comedies functioned as ideological battlefields where the gender system of patriarchy was examined, negotiated, and critiqued. These plays reflect the patriarchal order of their elite social milieu, but they also offer a unique critical vantage point on the paradoxical formation of patriarchal masculinity. On the one hand, patriarchal ideology rejects the mother and forbids her as an object of desire; on the other hand, patriarchal male identity revolves around representations of motherhood. Ultimately, the comedies reflect the desire of the Italian Renaissance male elite for women who will provide children to their husbands but not actively assume the role of a mother. In sum, Manes reveals a wide cultural understanding that motherhood-as an activity that women undertake, not simply a relational position they occupy-challenges patriarchy because it bestows women with agency, power, and authority. 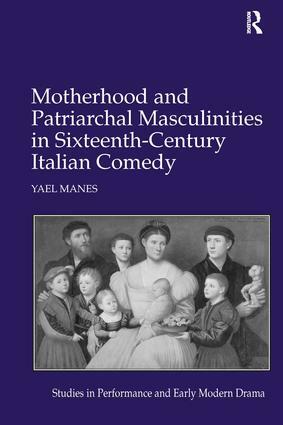 Manes here recovers the complexity of Renaissance Italian discourse on gender and identity formation by approaching erudite comedies not only as mirrors of their audiences but also as vehicles for contemporary audiences' ideological, psychological, and emotional expressions. Yael Manes received her doctorate from the Department of History at Cornell University. She is currently an Assistant Professor of History at Agnes Scott College.